Why You Need This: It would be bad news to find out that your brake light does not come on when you squeeze the lever while on the move. It has happened to us and it's hard to notice especially when the front drum brake responds just fine. The mechanical brake light switch that is fitted on your Honda CL / CB350, CJ / CL360 or CL450 is mounted in the right hand brake lever perch. It is a small plastic switch which is often stuck, dry rotting away, destroyed or even missing on many old bikes. Fear not because it is an easy swap out with one of our new high quality, Japan-made switches, guaranteed to fit and get your brake light working like it should. Also make sure the rest of your front drum brake is up to its full potential and replace the old brake shoes, brake cable and broken levers to ensure your Honda CL / CB350, CJ / CL360 or CL450 stops like it is new. Installation Tip: Make sure the electrical connectors are clean and the switch is seated correctly. It would also be good to check the brake cable and shoes at this time for excessive wear or binding. 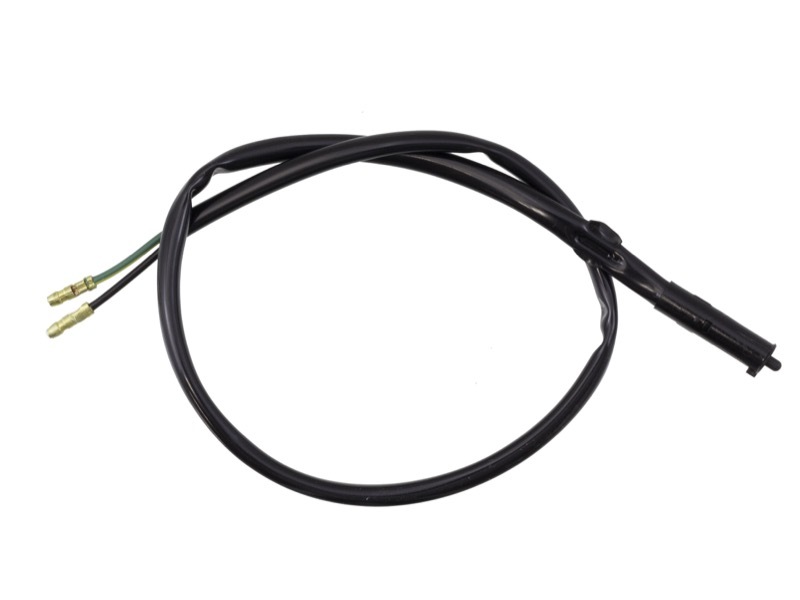 *Note: Some early CL450s and CB350s use a cable mounted brake light switch, which is obsolete. A conversion to this style switch is possible, but will require a right hand lever perch with a switch mounting hole and re-routed wiring. I bought this for my cb350 and it fit perfectly. It took me a good 15 minutes to figure out how to install it since I couldn't find any instructions anywhere. The way I did it is to insert the side with the two metal in first. Then pull the the whole cable through. The side with the light switch has a small protrusion. I had to make sure that protrusion was pointed at 9 o'clock (if I remember correctly) in order for the cable to go in all the way. Once I had the cable in the brake lever all the way, the rest is pretty easy. The end with the two metal contact go into the mess of wires in the headlight. I used a pair of scissors to cut the cable's cover about an extra inch. That gave me more room to move the cables around. One part of the cable plugs into a power connector. You should one extra of these somewhere in the mess of wires. The other end connects to the wire which is green and yellow. The connections are easily made, just push the cable into the connector. Easy and quick to put on and it works very well. I am happy with it. Well damn, after 43 years, my original finally died... sheesh! This was super easy and is plug and play. THANK YOU CMC! Switch works as advertised. Correct length, not too difficult to install. I just wish it was available to match the original gray color. I have been able to match all the new cables to the original gray, but the switch is only available in black. Still nice item.